Owing to our rich industrial expertise and skills, we are renowned as one of the most profound manufacturers and suppliers of Building Safety Net. These are designed by our experienced professionals who use high grade PP / Nylon ropes as per the IS 5175 standard. 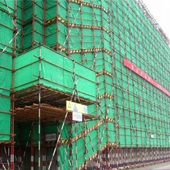 These safety nets are widely used at construction sites and are appreciated for their excellent quality, long service and ability to withstand harsh weather condition. In order to accomplish the varied requirements of our esteemed patrons, we offer a large range of Building Safety Net available in various standard dimensions and specifications.